Enjoy a unique holiday experience by joining an underwater tour in Aruba by semi-submarine, full submarine, or a sea trek. The slow descent to the bottom of the sea reveals a changing kaleidoscope of colours and movement as tropical fish weave through the underwater world. Amp up your Caribbean holiday with exhilarating motorised water sports on the gorgeous coastline of Aruba. Kayak through Aruba's calm waters and mangrove lagoons along Aruba's southern fringe. Close to Aruba there are two private islands, Renaissance Island and De Palm Island. Aruba's constant trade winds, extensive shallows and challenging wave conditions make Aruba a surfer’s paradise. Set sail for a glorious cruise along Aruba’s scenic coastline. Marvel at a diminutive damselfish as it guards its home among waving sea fans, or encounter a school of blue parrotfish. Land yourself a beautiful catch and hop aboard one of many deep sea fishing charters in Aruba that hunt for game fish. Glide across our tranquil waters on a paddleboard or catch a wave at one of our surf breaks. Join the fun of parasailing on Palm Beach and experience the exhilaration at the moment the parachute fills with air. A huge school of anchovies swiftly changes direction in a slippery, silvery line as a large barracuda makes its entrance, while yellow grunt fish and sturgeon swim unconcerned nearby. And watch thousands of tiny coral colonies wind and twist over every surface, creating a textured array of corals. The wonders of Aruba's underwater environment are accessible even to non-swimmers, with the options of submarine, semi-submarine and sea trek adventures. The remains of shipwrecks, spectacular coral reefs and an abundance of colourful sea life in Aruba comes into even sharper focus with a tour with full commentary. There are many ways to explore Aruba’s marine life, if you prefer staying dry while you discover, submarine tours or glass bottom boat tours are perfect for you. 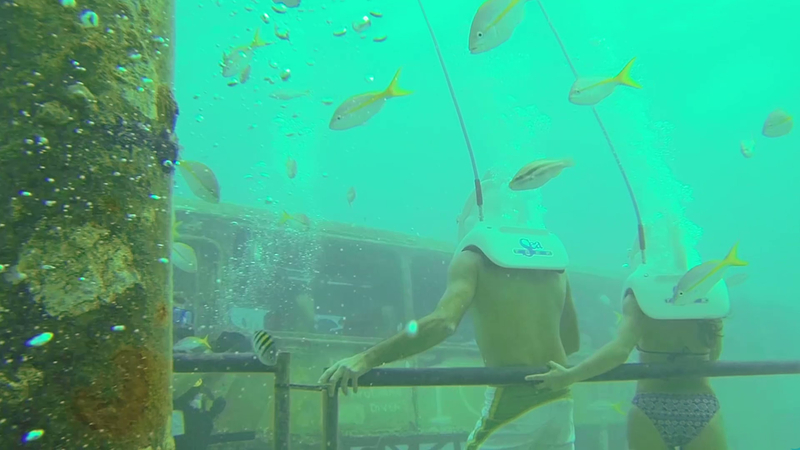 Observe a whole new world as you’re dipped into the deep blue on the underwater tours, or stay above the surface and see what’s right beneath it, on a glass bottom boat. No swimming required!